LA-based artist Sam Falls’ artistic output varies wildly from project to project, and from impulse to impulse. Perhaps the most consistent aspect of his work is the role of light and space in his photographs, a testament to his MFA in photography from the Bard/ICP program in New York. 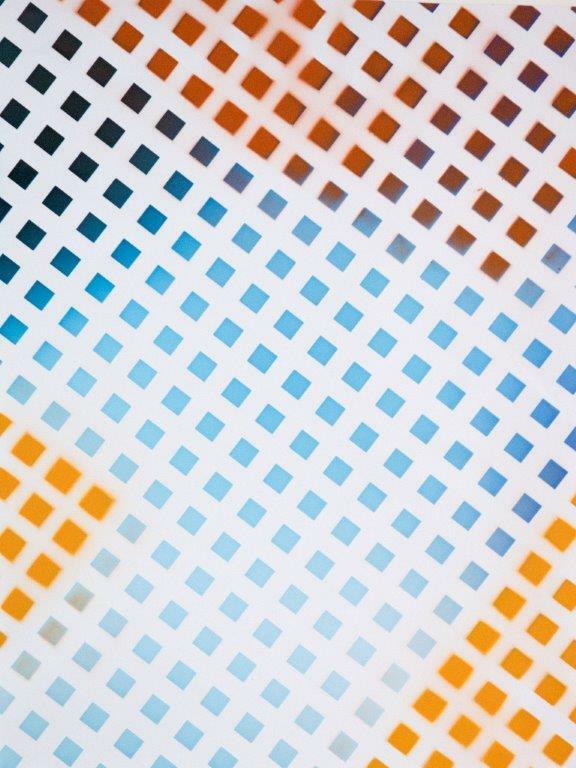 In recent years, Falls skillfully combines photographs with painted passages, as seen here in Untitled (Painted Photograms, Lattice 56) where an abstract, brightly-colored photogram pattern of varying shades of blue (made by exposing the photo paper directly to light) appears under airbrushed sections of orange and yellow acrylic that skew and disrupt the lattice-work composition. Falls’ work has been shown internationally, and his work is in the collections of the Museum of Contemporary Art, Los Angeles, and the International Center for Photography, New York, among others.